Aunque aún estamos en verano, en la red y en las tiendas ya empezamos a tener los primeros avances de las nuevas colecciones. ¡La verdad es que es muy difícil no resistirse! Olvídate del minimalismo y deja paso al maximalismo. Flores bordadas, brocados, tejidos lujosos, joyas espectaculares… Todo vale en esta tendencia sólo apta para las más atrevidas. Even though where still enjoying our summer, in the web and the shops we can already find a preview of the new season collections. Its’ really difficult to resist the temptation!! Therefore if you’re not capable of doing it, here you have some key trends in order not to get wrong with your buy!! Forget minimalism and leave your door open to the maximalism. Embroidered flowers, brocades, luxurious clothes, spectacular jewels… Everything works for this trend only suitable for daring women. Cruces, tules, vestidos negros, maquillaje gótico… La reinterpretación de esta tendencia debe hacerse con cuidado si no quieres parecer una “gótica” auténtica. El print animal sigue resistiendo el paso del tiempo. En faldas, blusas, bolsos o zapatos hazte al menos con una prenda o accesorio con este estampado. The animal print is a trend which resists the pass of time. Skirts, blouses, bags or shoes buy at least one piece with this print. Star buy: Bags or shoe with animal print. Otras de la tendencias que resiste el paso del tiempo pero que se actualiza con cortes péplum y botones dorados. Another of the trends that resist the pass of time: military. Update it with peplum cuts or brass-buttoned jackets. Star buy: Military jacket or parka. Rojo, burdeos, rubí, borgoña… Este tono ha inundado las pasarelas para esta nueva temporada… Cualquier tonalidad es válida siempre y cuando favorezca tu tono de piel. Red, burgundy, grape, ruby… This tone has splashed all the runaways of the new season. Any shade is valid as long as it flatters your skin. Star buy: Any piece or accessory that flatters you specially a dress or a pair of shoes. ¿Qué os parece chicas? ¿Cuál es vuestra tendencia preferida? What do you think ladies? Which is your favourite trend? La selezione leopardo mi gusta molto!!! I'm loving these trends! 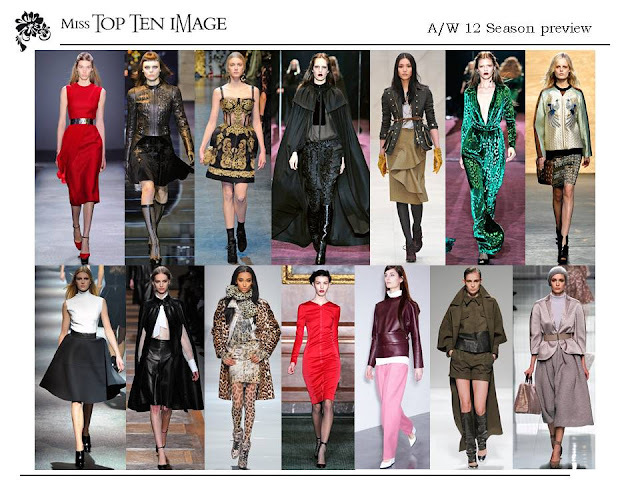 My favorites are baroque, animal print and leather. Can't wait to buy some pieces for fall! Also, I just wanted to give you a sincere thank you for your super sweet comment on my post yesterday. I'm so glad I've met blogging friends like you, and you never know, one day we might meet in person! I'm sure it would be filled with lots of shopping and fashion talk!! i am digging the baroque style! thnx fr visiting m blog dear..
Lovely things! Nice blog. What about following each other? En cada sección hay algo que me gusta según la ocasión. thanks you for advising those trends are GRRR for the winter ! thanks you for your nomination, from the bottom of my heart that's so lovely ! this is a very informative and great post! thanks for sharing! Amazing post, thanks for sharing where to get these trends! I am loving leather and the red! And the baroque looks fabulous too. Fall fashion is always my favorite. Such a nice post, love it!!! My first blog awards + my nominees! !